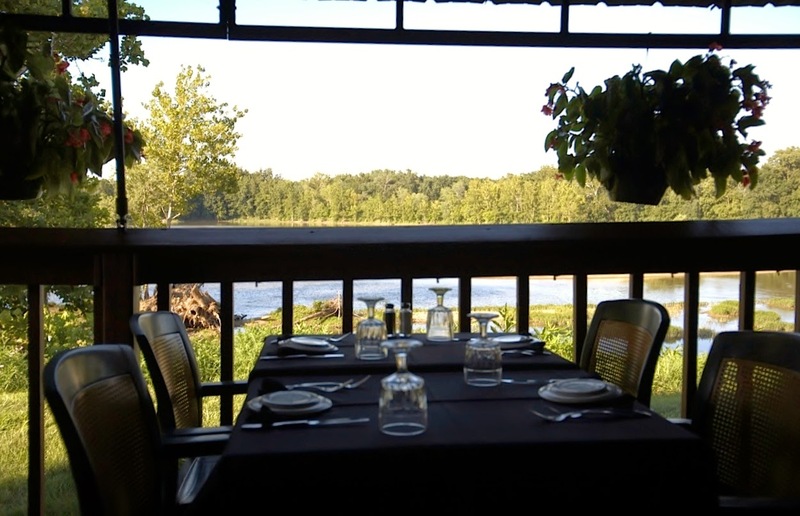 There is no doubt that you either love sitting outdoors to dine, or you don't. It's one of those dealbreakers for many of us. After the longest winter I can remember, I am ready to feel the sunshine while sipping a cold drink and nibbling on something delicious, or sit beneath the stars and moonlight while choosing which red wine to drink with a sizzling steak. Either way, dining al fresco is a fun way to lighten up a meal, change the scenery and feel the breeze in your hair. It isn't enough to toss out some plastic chairs next to the parking lot and expect people to enjoy themselves. No one cares to stare at a bug-riddled bumper while twirling their pasta primavera. 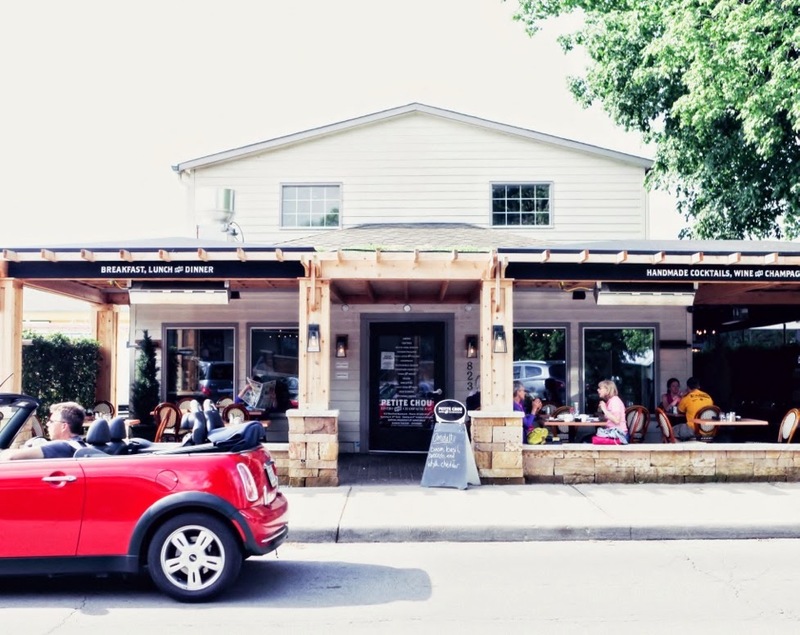 These establishments believe eating should be enjoyable and have gone the extra mile to make al fresco dining special. 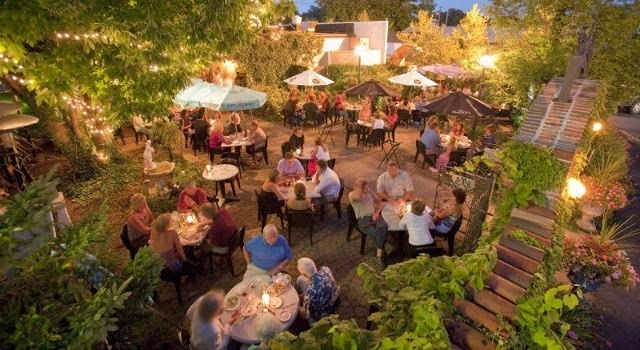 Below is the list of the Top 10 Best Indy-area restaurants for outdoor dining 2014 ~ ones that have taken outdoor dining up several notches. Elizabeth J. Musgrave is a syndicated fine-living, travel, food, wine and spirits columnist, freelance writer and photographer, and performing arts and restaurant critic for Gotta Go. Catch her on FOX59 Morning News Show for travel & leisure ideas. Read Infused, her spirits, wine & beer lifestyle column, at www.GottaGo.us and www.FoodDigital.com Gotta Go is published on www.Gottago.us, and in magazines. Follow her on Twitter @GottaGo, LinkedIn and Facebook. Will Jim Nabors Sing, "Back Home again in Indiana" at Indianapolis 500 2014? Will Indiana's adopted son Jim Nabors return to sing in person, "Back Home Again in Indiana," for the 98th Indianapolis 500 on Sunday, May 25? Nabors was unable to visit his second favorite home due to illness in 2012, so he performed via video screens at Indianapolis Motor Speedway for the pre-race traditional festivities. Yes, this year he will return and sing live once again ~ in Indiana. The Hoosier state's unofficial song being sung by Nabors has become a tradition for race fans around the globe and local residents alike. Nabors' rendition became an instant favorite at the "The Greatest Spectacle in Racing" since he performed it for the first time in 1972. When the original; performer didn't show up, Tony Hulman recalled seeing Nabors in the stands and approached him to stand in to sing the song. And the rest, as they say, is history. One last timeUnfortunately all good things must end eventually and this is true even of traditions at the Indy 500. Due to Nabors' health, the 9,000 mile trip from his home in Hawaii is too difficult and the entertainer, who will turn 84 years old the week after the race, is going out while still at the top ~ making this his last live rendition of the song at the oval track. To sign his guestbook & leave a message for Jim Nabors about what he has meant to you over the years and his singing and last appearance for the 500, click here. Who will replace Jim Nabors? No one has been rumored yet for his replacement, and we aren't even certain if they will attempt to. Perhaps they will do a live video broadcast from his home for a few more years or retire the song. It is still all up in there air as far as I am aware. It's too soon to even inquire. Instead, let's just enjoy this one last time of Indiana's adopted son singing our song. Nabors, known both for his singing career and his beloved character Gomer Pyle on television's "Andy Griffith Show," and, later, "Gomer Pyle, U.S.M.C.," has performed the popular song - with thousands of race fans singing along in the grandstands. The entertainer also enjoyed a successful career as a singer with 28 albums, with three hitting gold and one hitting platinum status. He also appeared in four films and numerous television shows, including his own The Jim Nabors Hour, The Andy Griffith Show and Gomer Pyle, U.S.M.C. 1972: Jim Nabors sings "Back Home Again" for the first time, stepping in at the last moment for the performer who didn't show up. He continues to perform the song through 1978. 1979 - '86: The entertainer only performed two years in the next eight. 1987 - 2006: He returns to sing, not missing the next 20 years. 2007: Nabors is too ill to travel, missing his first Indy 500 performance since returning in 1987. 2012: Nabors is unable to travel to perform at the race. He sang live by videostream from his home in Hawaii. 2013: Nabors returns to sing live at the race. 2014: Nabors announces this will be his last year to perform live at the Indianapolis 500. 2014 Indianapolis 500 tickets: Tickets are on sale for the 98th Indianapolis 500 Mile Race on Sunday, May 25 at IMS. Fans can buy tickets online at IMS.com/tickets, by calling the IMS ticket office at (317) 492-6700, or (800) 822-INDY outside the Indianapolis area, or by visiting the ticket office at the IMS Administration Building at the corner of Georgetown Road and 16th Street between 8 a.m.-5 p.m. (ET) Monday-Friday. Elizabeth J. Musgrave is a syndicated fine-living, travel, food, wine and spirits columnist, freelance writer and photographer, and performing arts and restaurant critic for Gotta Go. Catch her as Indy’s Travel & LEisure Adviser on FOX59 Morning News Show. Read Infused, her spirits, wine & beer lifestyle column, at www.GottaGo.us and www.FoodDigital.com Gotta Go is published on www.Gottago.us, and in magazines. Follow her on Twitter @GottaGo, LinkedIn and Facebook. With Indianapolis stepping it up its game in the craft cocktail arena, it was only a matter of time before people started wondering who is the best, where to find them and what the heck is a mixologist and how is that different than a bartender. Bartenders tend bar, they pour drinks, follow recipes and (if they are good) make great-tasting adult bevvys. There are numerous talented bartenders in the city. Mixologists take everything a step or three farther. They actually create the recipes bartenders follow, know the balance of acidity required and can tell you why they use ice, or not, when to rim a glass and what is needed when they taste a not-quite fabulous cocktail. They are the newest rock stars of the gastro world and below are the top in that field in Indy. This list was compiled by industry experts, competition judges and restaurant-bar owners for the up and coming, the already rocking it and those who are still considered tops even if no longer in the game. Unfortunately, with only room for 10, some names you might feel are missing were not able to make the list this year. The mixologists below have won competitions, impressed their field's experts and wowed clientele to the point they are (or soon will be) a name synonymous with the Indy Craft Cocktail scene. a chilled coupe or cocktail glass. Elizabeth J. Musgrave is a food and wine magazine columnist writing Destination Dining and Corks & Forks; a syndicated fine-living, travel, food, wine and spirits columnist, freelance writer and photographer, and performing arts and restaurant critic for Gotta Go. Catch her as Indy’s Personal Lifestyle Adviser on Indy Style, WISH8 (CBS). Read Infused, her spirits, wine & beer lifestyle column, at www.GottaGo.us and www.FoodDigital.com Gotta Go is published on www.Gottago.us, and in magazines. Follow her on Twitter @GottaGo, LinkedIn and Facebook. There may not be a more appropriate title on stage or screen than Anything Goes, playing now at Beef and Boards Dinner Theatre, Indianapolis. 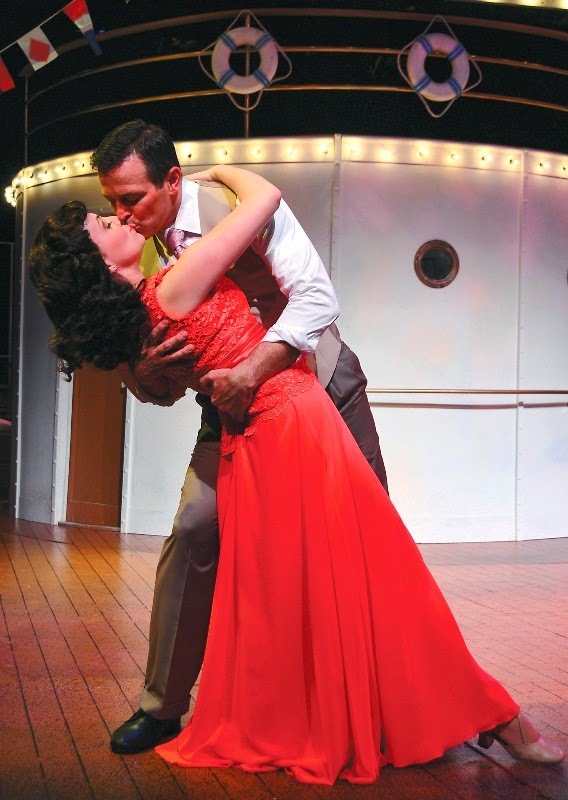 The live and filmed productions, considered a Cole Porter classic, have been revamped, altered and rewritten beyond all recognition at some points. It has been made into a film twice with Bing Crosby (1936 and 1956) and is originally (and loosely) based on the book by P.G.Wodehouse and Guy Bolton. 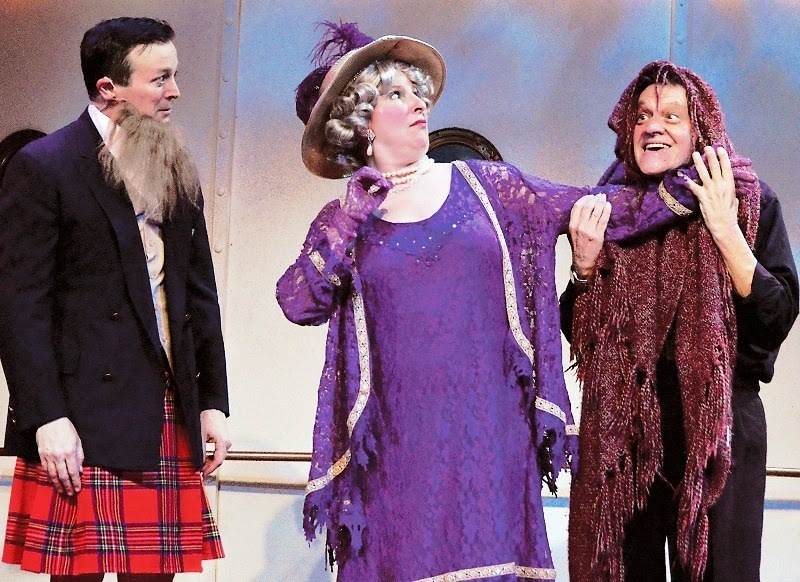 Set in the golden days of glamour, this comedy takes place on a luxury ship. Timothy Ford steps into the lead role of Billy Crocker, the lovelorn broker following his ideal woman Hope Harcourt, played by Whitney Meyer. Timothy Ford.... well, I couldn't quite place my finger on it, to be honest. He has a smooth charm that draws the audience in, perfect vocals and an air about him that seems as if you are watching an entertainer from a bygone era. Where had I had that sense before? Then, it hit me. Right here in this theater a few years back. Ford is the lead performer that swept up everyone's adoration with his umbrella while dancing in "Singing in the Rain." He also played one half of the lovable singing/dancing duo (with Curt Dale Clark) in "White Christmas." Best pairing in vocals are Meyer and Ford in All Through the Night. Jeff Stockberger brings down the house with his comical rendition of "The Gypsy in Me." Portraying the affable Lord Evelyn Oakleigh Stockberger brings his popular brand of funny to the uptight fiance' with an inner wild side. Deb Wims portrays the sassy, tough Reno Sweeney. Wims pairs up nicely with on-the-run Moonface Martin, played by Jack Milo. Milo's hang-dog expression brings the ahhh factor into play with his comic style. The show is filled with dancing and familiar songs, such as "Anything Goes," "You're the Tops" and "I Get a Kick out of You." Costumes (Jill Kelly), stage (Michael Layton) and choreography (Ron Morgan) all deserve extra applause this production to equal the amount of attention given when creating the show. 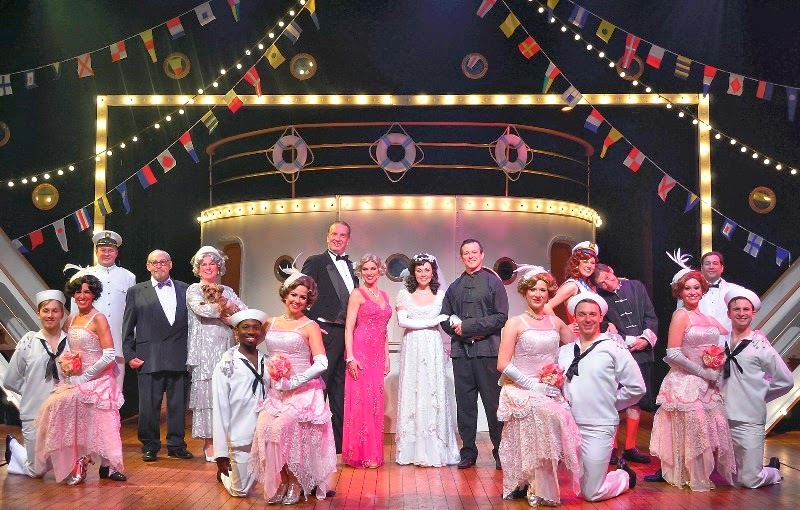 Bottom Line: Beef and Boards' Anything Goes brings a family friendly and colorful world of dancing, singing and comedy to the stage. Elizabeth J. Musgrave is a syndicated fine-living, travel, food, wine and spirits columnist, freelance writer and photographer, and performing arts and restaurant critic for Gotta Go. Catch her as Indy’s Personal Lifestyle Adviser on Indy Style, WISH8 (CBS) and as Travel & Leisure Expert on FOX59 Morning News Show. Read Infused, her spirits, wine & beer lifestyle column, at www.GottaGo.us and www.FoodDigital.com Gotta Go is published on www.Gottago.us, and in magazines. Follow her on Twitter @GottaGo, LinkedIn and Facebook. 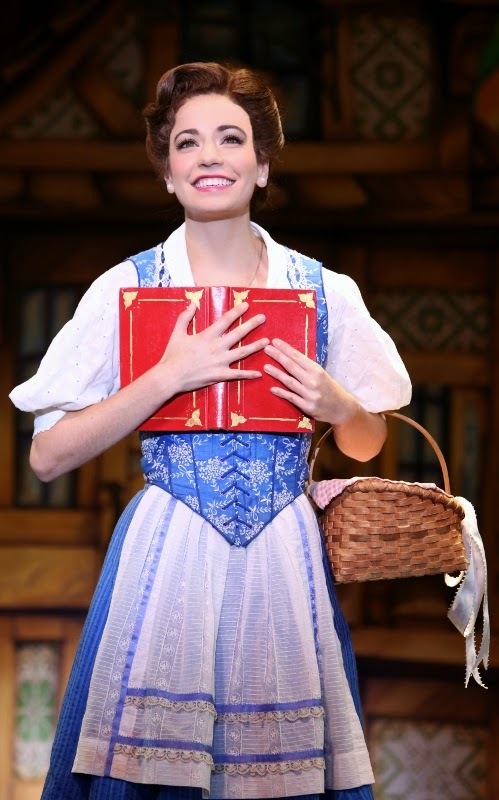 If you have been one of the patrons who was rather underwhelmed with the last couple of seasons' offerings from Broadway Across America Indianapolis, this line up might change your view. 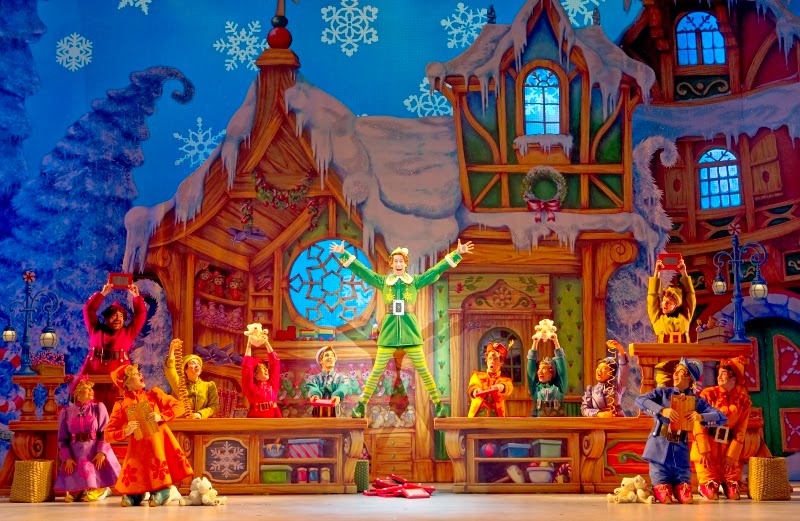 The 2014 - 2015 schedule shares magic, naughty dance moves and Santa's helpers. The shows I am looking forward to the most, I admit, are The Illusionists (loved the movie and love magic), Mamma Mia! ~ one of my favorite of all time with Broadway Across America, and Dirty Dancing. I cannot wait to see the choreography on that one. Which ones are you looking forward , which are done too often and which would you like to see hit our stages in Indy? Let me know in the comments section. 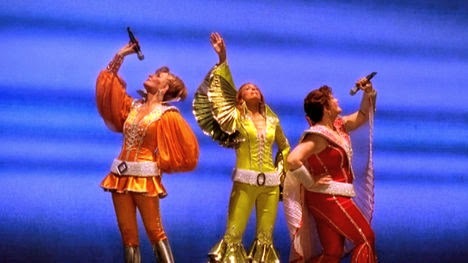 coming back for more, because every time feels like the first time at MAMMA MIA! and help New York remember the true meaning of Christmas. Direct from Broadway, the world’s best selling magic show is coming to Indianapolis. Directed by original lyricist and director Martin Charnin and choreographed by Liza Gennaro, this production of ANNIE will be a brand new incarnation of the iconic original. and triumphs of Joseph, Israel’s favorite son. will be the most challenging and triumphant summer of their lives. costumes, and dazzling production numbers. MONTHLY PAYMENT PLAN: Order before May 9, 2014 and make three easy monthly payments. Tickets for individual shows are not available yet and typically go on sale 4-6 weeks prior to the show.